There are many driving schools in Gloucester and Cheltenham, but the really sad news is that many of them are failing you. Shock, horror!! A learner can easily pay £1000+ for driving lessons, so you would expect a much better service than getting a one in three chance of passing your driving test, right? 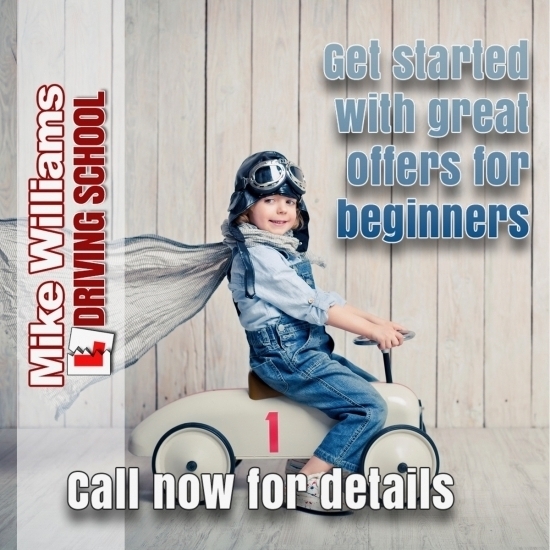 Here at Mike Williams Driving School we have a totally different plan to help you pass your driving test, and to back up our claim that we offer top quality driving lessons in Gloucester and Cheltenham, then check out our Triple Guarantee. We provide high quality, manual driving lessons in Gloucester and Cheltenham and with our money back guarantee as a part of our Triple Guarantee we can give you a solid promise that you will so enjoy your lessons. Soon you will be on the road, going far and wide on road trips with your mates.....that´s a promise! So to get started just give us a call. We will give you the confidence you need to go further away from home to experience different roads in areas where you are most likely to drive after your test. For instance, if you live in Gloucester you may drive to Cheltenham, and if you live in Cheltenham , you may drive to Gloucester. We even offer you an out of town shopping route or a visit to the railway station car park. By taking your intensive driving lessons with Mike Williams Driving School in Gloucester, you will be getting the best of both worlds with very high standard, cost effective lessons that have helped hundreds of learner drivers successfully pass their test and go on to be confident, safe and responsible drivers. Quality driving courses in Gloucester. So are you wanting to get on the road driving your own car in Cheltenham and beyond? Because that is what learning to drive is all about. They will be leaving you fully prepared for any driving test and having the confidence you need to impress the driving examiner and to get that magic phrase..."I am pleased to tell you that you have Passed"
You are so close to getting your driving licence and leading the life you want to live. You know, passing your driving test and getting your driving licence is one of those life changing moments. It can mean so much more than a few nudges of the snooze button in the morning because you don´t need to catch the bus...though that of course is one great bonus! Once you have your driving licence you have the freedom to drive anywhere in Cheltenham and further afield... loads of opportunities come your way. It could be a better paid job, meeting new friends or just weekend road trips. Imagine yourself loading up your car and going away for a long weekend with your friends...that´s what a driving licence brings. Life changing! By taking your intensive driving lessons with Mike Williams Driving School in Cheltenham, you will be getting the best of both worlds with very high standard, cost effective lessons that have helped hundreds of learner drivers successfully pass their test and go on to be confident, safe and responsible drivers. Quality driving courses in Cheltenham. I have a range of driving lessons to suit your needs, all of which are designed to help you become a brilliant driver. Passing your driving test is easy when you know how. The driving test is there to verify that you can drive on your own without any support, so that is what you are going to be doing before you go into your driving test. Just before your test you will be doing some fine tuning and work on advanced driving, in short you won´t need me and that´s how I am going to prepare you for the driving test. You will end up going into your driving test being able to show the driving examiner you are good to go, and you will have the confidence as well. Give me a call on 07863239331 , and we can start your journey to get a full driving licence together.